Q: Can I Better Organize My Gmails? A: Nowadays, instead of receiving photo attachments from the kids and daily humor via email, we might turn to our family and friends’ social media sites. However, email is still an important part of the non-public communication process, and most of us at some point have set up a free email account. Webmail providers include Yahoo, Microsoft’s Hotmail, and AOL, so your email address might read ‘johndoe@hotmail.com’. Alternatively, you may also be getting your email through your internet service provider (ISP), so your address might be ‘johndoe@state.rr.com’ if you’re using cable’s Road Runner service, for example. Webmail is advantageous because you can have all your emails synchronized in one place (even if you later change your ISP) and retrieve/send from any device that can access the internet. One of the most popular webmail providers today is Google with its Gmail service. Google’s email system is so powerful that your ISP may be using it within its own brand. For example, customers using Clearwire DSL service are assigned an email account name ending in ‘…@clear.net’, but Clear’s email service is really hosted by Gmail. Filtering – Gmail ignores the period symbol ‘.’ in email addresses, as well as anything after the ‘+’ symbol before the ‘@’ sign. As an example, let's say that your email address is: janedoe@gmail.com. However, emails that are sent to jane.doe@gmail.com or janedoe+AARP@gmail.com will also arrive in your mailbox. Therefore, if you must give out an address to a marketer, you might want to use jane.doe@gmail.com, and then a month later, you can filter all incoming emails by that name and delete them. As another example, if you sign up to receive AARP’s monthly newsletter via email, by providing the ‘janedoe+AARP’ address, you can easily filter all newsletter emails from that source and place them in a separate folder. With both of these methods, you can also get an idea if the party that you originally provided the 'special' name to is sharing your email address. Searching – You can input keywords in the Gmail search bar, for example ‘seminar’, and Gmail will list for you all the emails which contain that word. You can sort your emails, e.g. by recipient name or sent date, to look for specific transmissions. 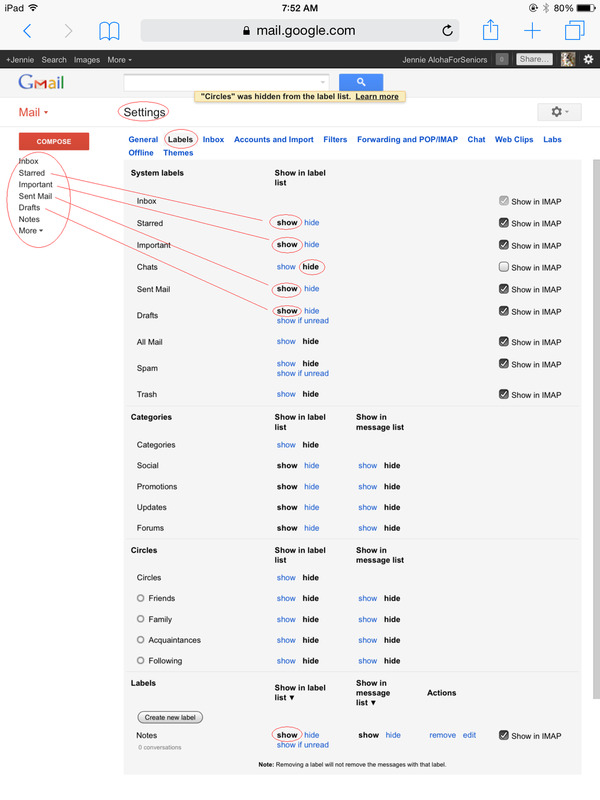 Organizing – As shown in the above screenshots, Gmail desktop settings let you control your email experience. By clicking on the “Gear” icon on the top right, you can customize your Gmail interface, such as the Gmail left column to show only desired boxes. Different display themes are available, as well as additional selections of stars and symbols which you can use to tag and color code different emails (e.g. red star for important family emails) making them easier to sort and group them together. Using utilities – Within the “Gear-->Settings” menu, there are interesting “Labs” where experimental features are available. One “Labs” function that’s greatly useful is “Undo Send”. By ‘enabling’ this mode in “Labs” and specifying my ‘Undo’ time length to 30 seconds in the "Gear-->Settings-->General" menu, I now have the luxury of clicking ‘Send’, and when the ‘Your message has been sent’ status appears, I have up to 30 seconds to click the ‘Undo’ function so that the email appears back in the draft folder without being sent, for further editing. This is useful when you realize that you’ve forgotten to include an email attachment at the very moment that you click ‘Send’. Another useful utility app is the “Offline” mode which you can install from the “Gears-->Settings” menu. Once this is installed, you can compose emails offline, and then the next time you connect/sign onto the internet, your offline emails are sent off. Google’s goal is to ‘smarten up’ the way that we all use email. The current default Gmail Inbox categories are ‘Primary’, ‘Social’, and ‘Promotions’, and as your emails come in, Google attempts to sort the transmissions into these categories in order to make your review easier. In future postings, we’ll address other upcoming Google enhancements, such as their separate Inbox app that's now being beta tested, as well as security concerns like protecting your password and maintaining email backup systems.